Florida Survival Gardening: TODAY: Snag some GREAT edible plants at the 326 Community Farmer's Market! TODAY: Snag some GREAT edible plants at the 326 Community Farmer's Market! I've decided to start exhibiting some of the great plants in my nursery at the 326 Market in Ocala. 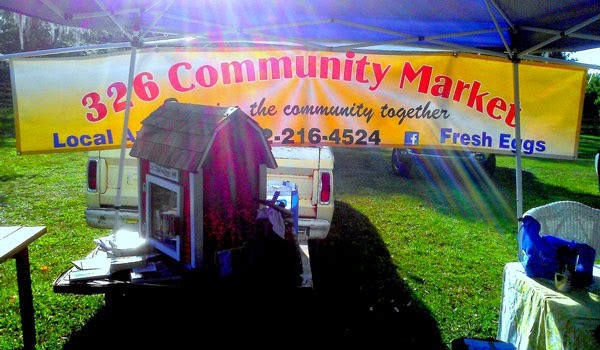 The 326 Community Market runs every Thursday from 3 - 7PM. I've been there before... it's a wonderful, laid-back Farmer's Market with good vendors, good food and great people. It's about time I start expanding my reach and getting edibles into more people's hands. Mulberries... Cassava... Pears... Apples... Pomegranates... Rabbiteye blueberries... Nopale cactus... Surinam cherries... Mystery Seed Balls... Chestnut trees... and more! Hope to see you there. My prices are good and even if you don't buy anything, I'm always game to talk about gardening. Planning a Food Forest? Don't Go Scorched Earth!